CSV file, also known as Comma Separated Values file, allows data to be saved in a table structured format. You can use this CSV file format to exchange data from a database or a spreadsheet between applications. Each line in a CSV file represents a record in the database, or a row in a spread sheet. Each field in a database record or cell in a spread sheet row is usually separated by a comma. However, you can use other characters to delimit a field, such as a tabulator character. FingerTec's Ingress & TCMSv3 software comes with a feature for exporting of Data from Audit List in either TXT or CSV format. These transaction data are the raw data output obtained from the terminal. 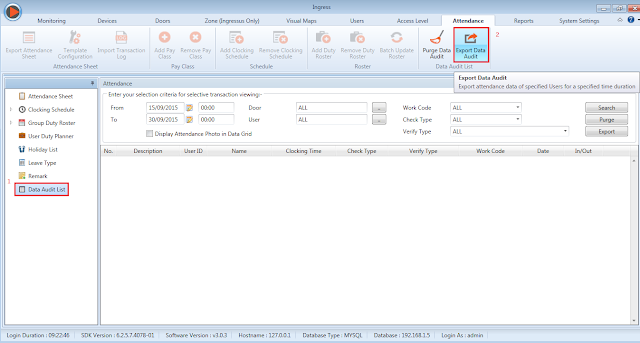 You can use the raw data in the third party software or payroll system that requires TXT or CSV file format. The images below are from Ingress software, however the steps also apply to TCMSv3 which has a slightly different interface. 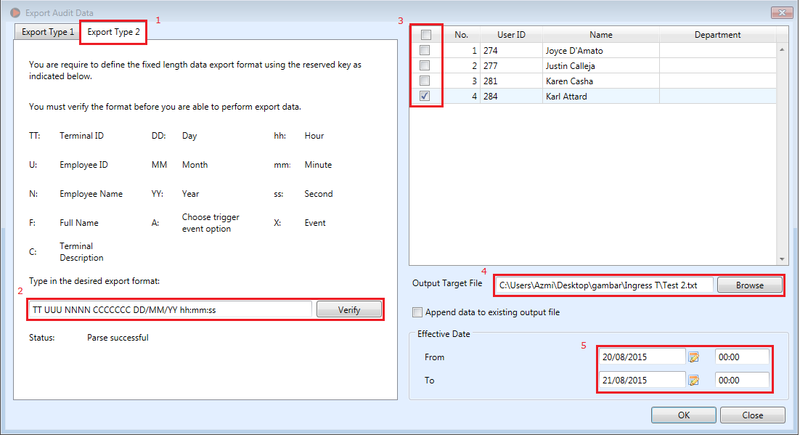 Follow the steps below on how to Export Data from Audit List to either TXT or CSV format. 2) In the Export Audit Data window, select Export Type 2. 3) Type in the desired export format and click Verify to lock and save the data format. System will show the status of either Parse Successful or Parse Failed. 4) Select at least a minimum of one User and choose the Output Target File where you want to save the exported file. 5) Specify the effective date and time. Note: If you want to save the data for 1 day, i.e. 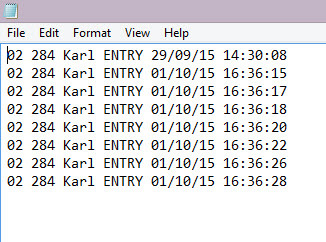 20.08.2015, you must key in the date range from 20.08.2015 to 21.08.2015 and enter 00.00 in both time columns. and a successful message will be prompted once it is completed. examples of the output files in TXT and CSV format. 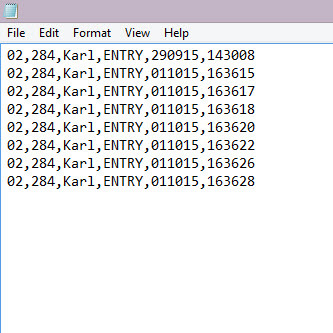 How i can export all data to TXT file as the below format? • Each line must have exactly a fixed length of 50 characters. How can Get terminal User list as a TEXT File. Regarding to your query, you can generate the Terminal User Listing report under Report tab (refer picture http://prntscr.com/ndi7dq). 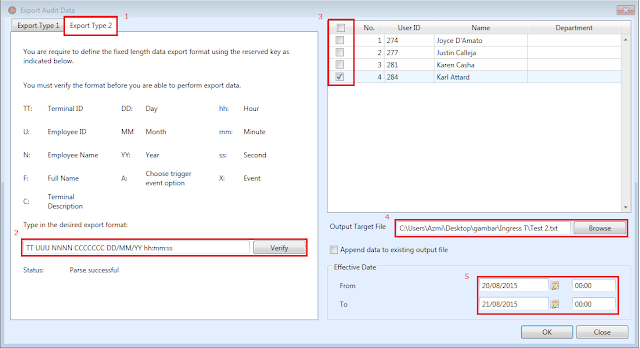 Then you can save or convert the report as txt file or other format (refer picture http://prntscr.com/ndi7vq).